"[Cyndi Lauper]... helped launch the True Colors tour, with proceeds going to gay rights groups, and the True Colors Shelter for queer youth in New York City. She also recently launched the Give A Damn campaign to promote respect for queer people – that’s the TV spot in which Oscar winner Anna Paquin comes out as bisexual..."
Protesters at Cyndi Lauper’s concert on Saturday (July 3) at Queen’s Park in Toronto? At the June 7 meeting at the 519 in support of free speech and to organize against Pride Toronto’s decision to ban the term “Israeli apartheid” at the big parade (Pride Toronto has since changed its mind about that), some activists suggested taking action at Lauper’s big concert Saturday (July 3) at Queen’s Park. Next to the Pride Day parade, her event is considered this year’s biggest draw. When I ask Lauper what she thinks about a protest at her gig, she gives it some serious thought. “Oh,” she says, and I can almost hear the gears turning inside her head. “In a way it is like apartheid [in Israel], because the Palestinians are outside of the city like the South African blacks were. With all the political talk and Lauper’s high-profile support of the LGBT community, it’s easy to forget that she has a new album. 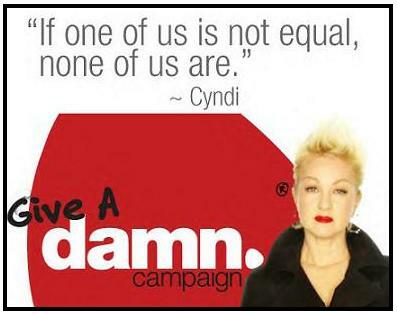 Learn more about Cyndi Lauper's Give A Damn campaign by visiting her official site.